What kind of truck and trailer will my freight be shipped on? 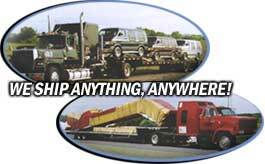 We have over 700 trucks available, including flat bed, step and open trailers, and car and truck transports. They vary in size and capabilities to handle all weights and sizes of loads. How much will my freight be insured for? In excess of $200,000 per shipment and more is available to meet your needs. When can I expect my freight to be picked up? We will do everything possible to comply with your schedule, depending on availability of trucks in your area. Can I have my freight delivered where and when I want? We can deliver anywhere in the continental U.S. Upon pick up of your freight we can give you a close estimate of when it will be delivered. Our driver will be in contact with you regarding any delays due to weather, etc. In most cases we can set up a credit account for you and you will be billed as deemed appropriate. We can also deliver on a C.O.D. basis. We do not accept credit cards. Can I expect a prompt rate quote? If you request a rate quote on-line or by phone one of our experienced office personnel will have a quote for you during normal working hours as soon as possible. Will my freight be dropped and stored at a terminal? No. We do not have transfer or storage terminals. Will my freight be transferred to another truck in the course of transport? Only in case of a major break-down of the original truck.